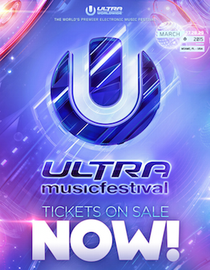 Tickets for the 17th annual edition of Ultra Music Festival in Miami, confirmed for 27, 28 and 29 March 2015, are now on sale. Available to purchase exclusively at ultramusicfestival.com, general admission tickets for the three-day festival are priced at $449.95, nearly $50 less than the 2014 event. VIP tickets are priced at $1,149.95. These prices include taxes and fees though a nominal shipping surcharge will be added. A payment plan for General Admission tickets will also be available. This ticket release comes just one day after the Official Aftermovie for Ultra Music Festival 2014 was unveiled on UMFtv’s YouTube channel. Created by FINAL KID’s Charly Freidrichs, Relive Ultra Miami 2014 allows the viewer to re-experience the Ultra Music Festival 2014 through the lenses of some of the world’s biggest DJs and fans alike. Shot in 4k and set to a musical score that was exclusively produced for the film itself, this 16-minute movie demonstrates precisely why Ultra Music Festival is one of the best electronic music events in the world. Having pioneered a new approach to creating festival after-movies in 2014, this latest offering is the third instalment in a new series of short films from Dutch moviemaker Friedrichs and UMF Films, following COLORS & WAVES (Relive Ultra South Africa 2014) and ‘ANGELS IN BUENOS AIRES’ (Relive Ultra Buenos Aires 2014) in July and September 2014, respectively. Check the video out below or click the image.